Gluteus maximus the largest and heaviest muscle in the body. It is the most superficial of all gluteal muscles that are located at the posterior aspect of hip joint. This makes it the largest muscle at the hip representing 16% of the total cross sectional area (TCSA). Gluteus Maximus's size allows it to generate a large amount of force. The muscle evolved from an adductor of the hip which is still seen in lower primates today. The development of the muscle's function is associated with the erect posture and changes to the pelvis. It now functions to maintain the erect posture as one of the muscles that extends the hip joint. The fibres of Gluteal maximus are largely perpendicular to each other and line up in the direction of pull giving it it's quadrilateral shape and course appearance. There are two layers to the muscle which pass down to the insertional attachment. 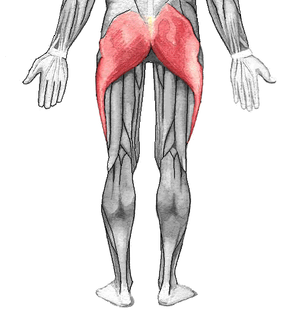 Gluteus maximus covers all of the gluteal muscles except for the antero_superior third of the Glutes medius. This uncovered part of Gluteus medius is the safe area at which we should apply buttocks dorso gluteal intramuscular injections . The ischial tuberosity can be felt deep to the lower part of the Glutes maximus , When the thigh is flexed the lower border of Glutes Maximus moves superiorly , exposing the ischial tuberosit subcutaneously .Therefore you don`t sit on your Glutes Maximus muscle but you sit on the ishial tuberosity , ischial bursae , subcutaneous fat and skin. Posterior gluteal line of the ilium and portiom of the bone superior and posterior to it . Posterior surface of the lower part of sacrum . Side of the coccyx . Aponeurosis of erector spinae . Attaches to thoracolumbar and it`s associated raphe .By this attachment Glutes maximus is coupled to the ipsilateral multifidus and contralateral Latissimus dorsi forming posterior oblique and deep longitudinal myofascial slings you can read more in details of these in the Anatomy Slings and Their Relationship to Low Back Pain. The lager proximal portion of the muscle and the superficial fibers of distal portion of the muscle. The larger proximal portion, which forms three-quarters of the fibres inserts into the Iliotibial tract the other fibres insert indirectly by the lateral intermuscular septum into linea aspera of femur . The deeper fibres of the distal portion of the muscle form an aponeurosis which attaches to the gluteal tuberosity of the femur. The gluteus maximus is supplied by the inferior gluteal nerve (root L5, S1 and S2). Cutaneous supply is mainly provided by L2 and 3. Gluteus maximus main actions are to extend and laterally rotate the hip joint. Furthermore, upper fibers can abduct the hip whereas the lower fibers can adduct. As a powerful extensor of the hip joint, the gluteus maximus suited to powerful lower limb movements such as stepping onto a step, climbing or running but is not used greatly during normal walking. Gluteus maximus and the hamstrings work together to extend the trunk from a flexed position by pulling the pelvis backwards, for example standing up from a bent forward position. Eccentric control is also provided when bending forward. Superior fibers of the gluteus maximus can extend the knee through its attachment to theIliotibial tract. Gluteus maximus has several stability roles: balancing the pelvis on femoral heads thus maintaining upright posture, the attachment throught the iliotibial tract supports the lateral knee, and lateral rotation of femur when standing assists raising the medial longitudinal arch of the foot. Attachment of Glutes maximus to fascia of SIJ and it`s ligaments made the Glutes maximus to become a contributing force in self _ bracing mechanism of SIJ . Gluteus maximus works to offload the ischial tuberosities when supporting body weight in sitting by a static of dynamic contraction. If the gluteus maximus is paralyzed climbing stairs and running will become very difficult however, other muscles can extend the hip. Gluteus maximus can be trained to produce functional knee extension when quadriceps femoris is weak or paralyzed. Research has indicated that contraction of the deep abdominal muscles may assist with the contraction of gluteus maximus to assist with the control of anterior pelvic rotation. Gluteal muscle weakness has been proposed to be associated with a number of lower limb injuries. Arthrogenic inhibition from the hip joint . Pain reflex inhibition either hip pain or lumbopelvic pain. Stretched weakness of Glutes maximus . Sedentary life style and not doing sports since all the work will be done by hamstring as an Energy conservative mechanism of the body to save Glutes maximus for hard activities as running, raising stairs ,etc .So not doing sports won`t engage your Glutes maximus and increase it`s inhibition and making hamstring to take over it`s action and becomes synergistic dominant. prone bridge/plank (9% ± 7%MVIC). Lunge with backward trunk lean (19% ±12% MVIC). Bridging on Swiss ball (20% ±14% MVIC). Unilateral bridge (40% ± 20% MVIC). Forward step-up (74% ± 43% MVIC). a neutral hip and spine position during this exercise. The low-level activation (9%MVIC)exercises group are most likely reflected the GMax’s role as a hip and spine stabilizer. Locate the iliac crest then move posterior along the crest to a small bony process called the posterior superior illac spine (PSIS). Place the palm of your hand with fingers pointing down and towards the mid line of the body. The upper hand now covers the origin attachments and under the palm is the bulk of gluteus maximus. Contraction of the muscle can confirm this. Gluteus maximus can be palpated whilst it acts during standing hip extension, a step-up, or whilst standing raise the medial borders of the foot. You should first search for the cause of the Glutes maximus inhibition in your patient ,Then try to solve this problem,Then begin by activation of your Glutes maximus gradually and progressively as mentioned in the Activation exercises above . ↑ 2.0 2.1 Reiman MP , Bolgla LA, Loudon JK. A literature review of studies evaluating gluteus maximus and gluteus medius activation during rehabilitation exercises. Physiotherapy Theory and Practice. 2012 :28(4): 257-268. ↑ 4.0 4.1 4.2 4.3 4.4 Palastanga N, Soames R. Anatomy and Human Movement: Structure and Function. 6th ed. London, United Kingdom: Churchill Livingstone . 2012. ↑ 5.0 5.1 5.2 5.3 5.4 5.5 Kendall F.B , McCreary E.K ,Provance P.G .Muscles: Testing and Function, with Posture and Pain (Kendall, Muscles) Fifth, North American Edition. Philadelphia. Lippincott Williams & Wilkins, 2005. ↑ Kim TW, Kim YW.Effects of abdominal drawing-in during prone hip extension on the muscle activities of the hamstring, gluteus maximus, and lumbar erector spinae in subjects with lumbar hyperlordosis; J Phys Ther Sci. 2015 Feb : 27(2):383-6. ↑ 8.0 8.1 Page .P, Frank C, Lardner R. Assessment and Treatment of Muscle Imbalance: The Janda Approach .Champaign . Human Kinetics. 2010. ↑ Freeman S, Mascia A, McGill S. Arthrogenic neuromusculature inhibition: a foundational investigation of existence in the hip joint.Clinical Biomechanics .February 2013:28(2):171–177. ↑ Arab ِA M, Ghamkhar L, Emami M , Nourbakhsh M R. Altered muscular activation during prone hip extension in women with and without low back pain .CHIROPRACTIC & MANUAL THERAPIES.2011.19_18 .